I was about 10-years-old when my family moved to Guwahati, Assam, from the desert-town of Bahrain in the Arabian gulf. If Guwahati was a bustling urban space at that time, my mind did not register it. I'd wait for the school bus, across from a large mansion, and look at jackfruit flowers in bloom, their faces as large as dinner-plates. In the spaces between the pavement and the road, there were strange mushrooms and bright wild flowers. Nights without electricity meant sitting out in the balcony amidst fireflies. Mornings meant waiting for the black-and-white songbird that a neighbour called "Saarika". Words like "fertile" and "lush" suddenly acquired shape and texture. Behind our house, the fields and marsh were ringed by trees weighed down almost to the ground with overripe fruit. Our first evening, we saw in the far distance, a bent, old man walking through the fields, a black umbrella hanging on his back. The next evening, we gasped as he unfurled it and took to the skies. It was a stork that I now know as the Greater Adjutant. 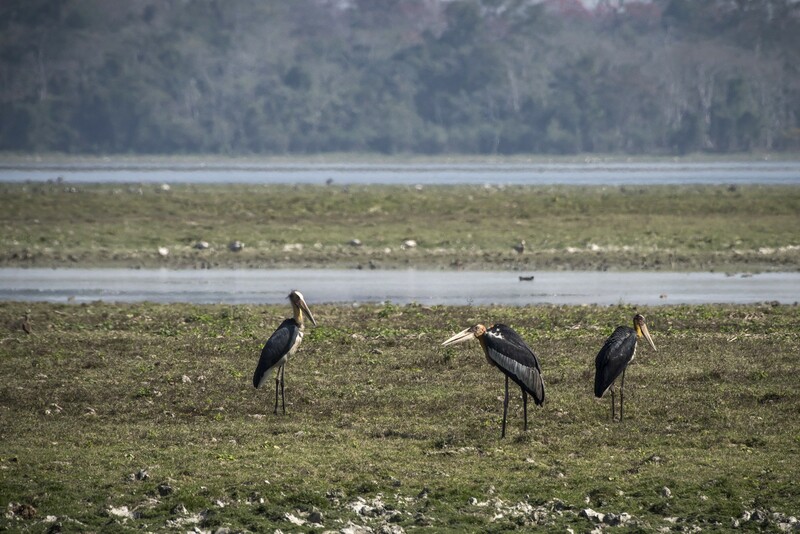 A Greater Adjutant Stork (centre) conjures up the image of a bent, old man walking through the fields. In the end, we only spent three months in Guwahati, fleeing back to Madras when practical problems hit us. We moved many cities after that; I moved countries too. I put down stronger roots than I had ever had in Guwahati. But those memories still took up a disproportionately large space in my mind and my nostalgia. I thought often of Saarika, sitting close like a friend. I dreamt often of the old man who turned into a bird. Almost 30 years later, I finally find myself back in Assam. We land in Guwahati but drive directly to Kaziranga Wildlife Sanctuary. On our first Jeep safari to the eastern side, I get excited when we see a group of Lesser Adjutant storks. I ask our guide if we will see the Greater Adjutants. "Not in this season," he says, "Not at all." As we finish the safari, and get more familiar, I prattle on about how I used to see it in Guwahati - as though telling the story might change something. And suddenly, it does. There, among a flock of Lesser Adjutants and Woolly-necked Storks is a solitary looming presence that I remember well. I watch and take it in for half an hour, this Greater Adjutant, as it feeds and moves. When it unfurls its wings and takes off, its wingspan is as dramatic as I remember. "I swear I have never seen one in this season," the guide says again. After two weeks of visiting forests, we return to Guwahati. It is nothing like I remembered, of course. Save for little clues, we could be in a city anywhere in India - except for in the heart of the old city, where there are still trees and flowers, and long plots with rows of houses like ours. Before we leave, I make one more attempt to see the Greater Adjutant. In a familiar but sad tale of urbanisation, the once-common bird can most often be seen at a large garbage dump near the airport. We first head to Deepor Beel, the lake on the other side of the garbage dump. The lake is green with algae, and this hot afternoon, the water-levels are low. There are more picnicking people than there are birds. Our taxi driver is reluctant when we mention the garbage dump. His car is white and shiny and we must seem like utterly demented tourists. We walk to another part of the lake and try again. Between me and the husband, he is sharper-eyed. But I see it first. Even through the binoculars, it is just a blur on the other bank. "Above the egrets, below the grey building," I say, trying to show him, "There are two men there, and the dark one on the left is the stork." We report the sighting to our driver, and manage to sweet-talk him into driving us to the garbage dump 10km away. He says nothing, but drives us right into the heart of it. There are endless smoking stacks of garbage, as tall as houses. There are tractors, people, birds, and, sadly, children. When the driver stops, he puts a kerchief over his mouth. 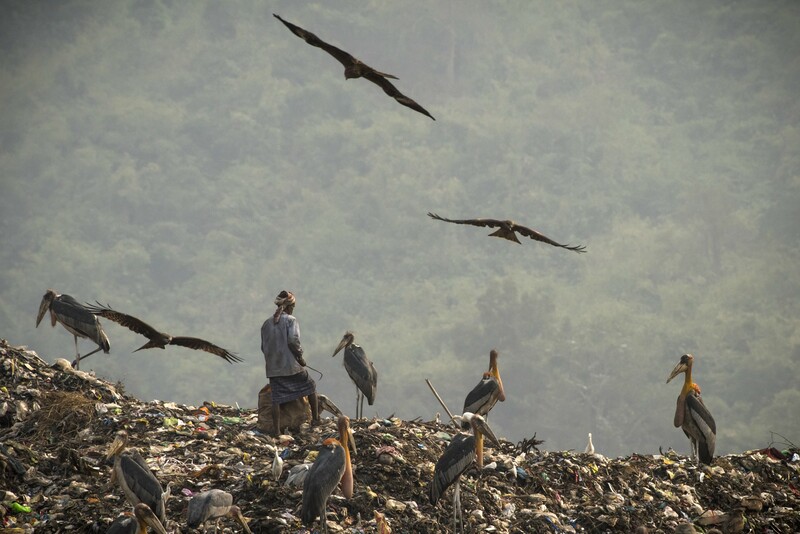 There were quite a number of Greater Adjutant Storks at the garbage dump, and nearly none everywhere else. I step into the chaos. There are more Greater Adjutants than I can count, some so close that I have to switch to a wide-angle lens to take pictures. There are men standing just next to the storks, there are Black Kites flying everywhere. I focus and take pictures, momentarily lost in the sight of these magnificent birds. When I lower my camera though, everything hits me again - the stench, the flies, the blue plastic bags adding terrible colour. I feel overwhelmed and inadequate. As we drive away, our driver clucks in irritation at the flies, and opens windows to let them out. As for me, my head is abuzz with something else entirely. Suchi Govindarajan works as a technical writer and pretends to be a photographer. In her spare time, she enjoys writing humour pieces and poetry. She hates brinjals. You can read her work at http://www.suchiswriting.com. She posts as @suchiswriting on Instagram.